1.Reflective glass beads are made of glass sand, after melting temperature the formation of a tiny glass beads, was observed under the microscope spherical, colorless, transparent, refractive index of 1.50--1.64 between the diameter is generally between 75 microns to 1400 microns. 2.Reflective glass beads for road marking (paint) in the reflective material, can improve the retroreflective pavement marking paint performance, improve night driving safety, national transport sector has to be determined. 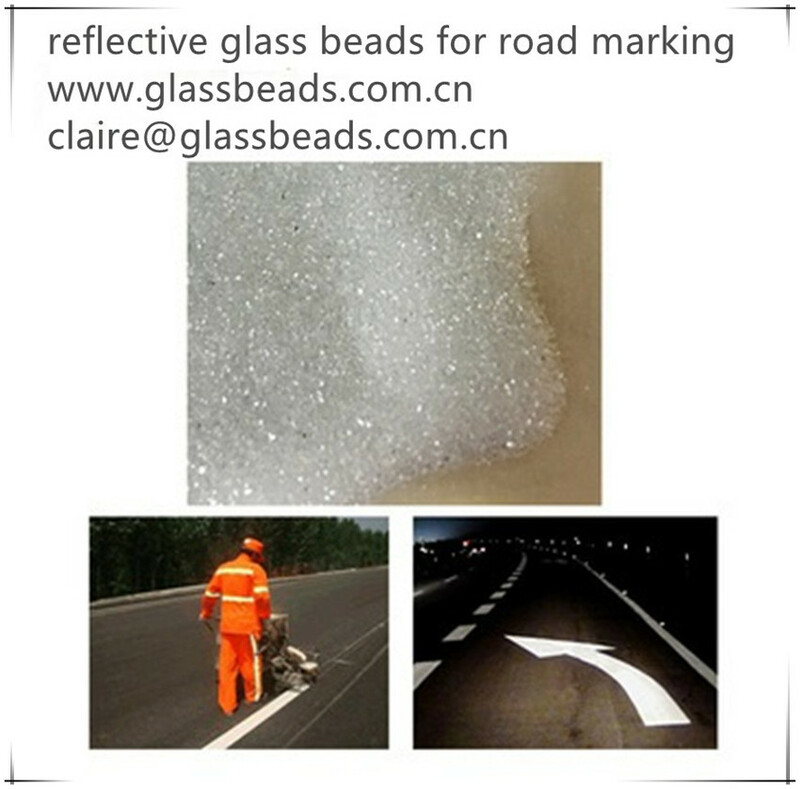 Now, reflective glass beads has become a road safety products, reflective material can not be replaced. 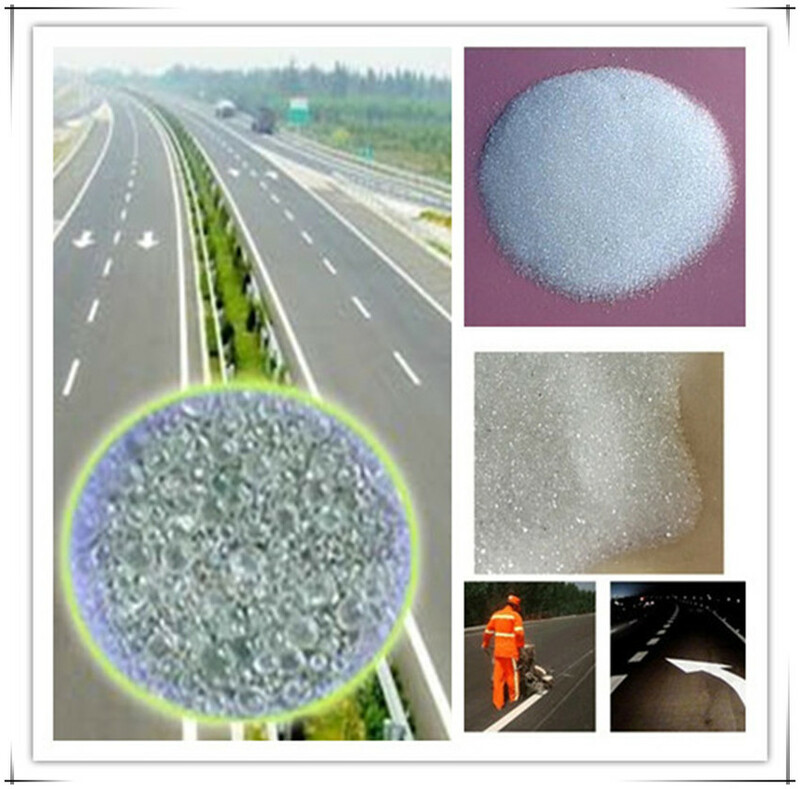 3.Reflective glass beads for road, mainly used in normal temperature, hot melt road marking paint, a method for premixed material can ensure marking period in the life of the long--term reflective; one kind of construction in the marking surface spreading, can play an instant reflection effect. Glass Microshpere Glass Beads Road Marking into paint based on the ratio of 18-25% (weight percentage), so that the road paint can still keep reflectivity during wear and friction. The ratio is refer to the specification of Communication Industry Standard of the People`s Republic of China JT/T280-2004, the standards may be different from different countries and areas. We are one of the largest special supplier in Asia for Reflective Road Marking Spherical Glass Beads. We can produce All-weather Rain Night Reflective Glass Beads, Grinding Media Spheres Grinding Glass Beads,Shot Peening Shot Blasting Glass Beads,reflective glass beads, glass beads for road marking, mixed glass beads with different specification and particle sizes based on the standard of countries or areas, such as EN1423/1424, AASHTO M247, BS6088, JIS R3301 and KS L2521 etc. The production of glass beads should choose raw materials, raw materials determine the quality of the Micro Glass Spheres, raw materials should choose clean glass with good strength and toughness. Then make the glass crush into glass sand, according to the size of the granularity, crushed into a uniform moderate glass sand, in order to save manpower and material resources during burning. The glass sand drying, then use the gas furnace for firing, the natural gas temperature adjusted to 800-1000 degrees, also check the roundness of the glass beads. For Glass Beads in Traffic Paint semi-finished products, sieve with the shaker. The screening of qualified glass beads, according to a certain proportion to mix, if you need to coating, need to be completed before stirring. Road Marking Reflective Glass Beads Packing and shipment. Looking for ideal Tiny Glass Beads Pavement Marking Manufacturer & supplier ? We have a wide selection at great prices to help you get creative. All the Microscope Spherical Micro Beads are quality guaranteed. We are China Origin Factory of Reflective Glass Beads for Road. If you have any question, please feel free to contact us. Copyright © 2019 YONGQING BAILUYUAN GLASS PRODUCTS CO.,LTD All rights reserved.